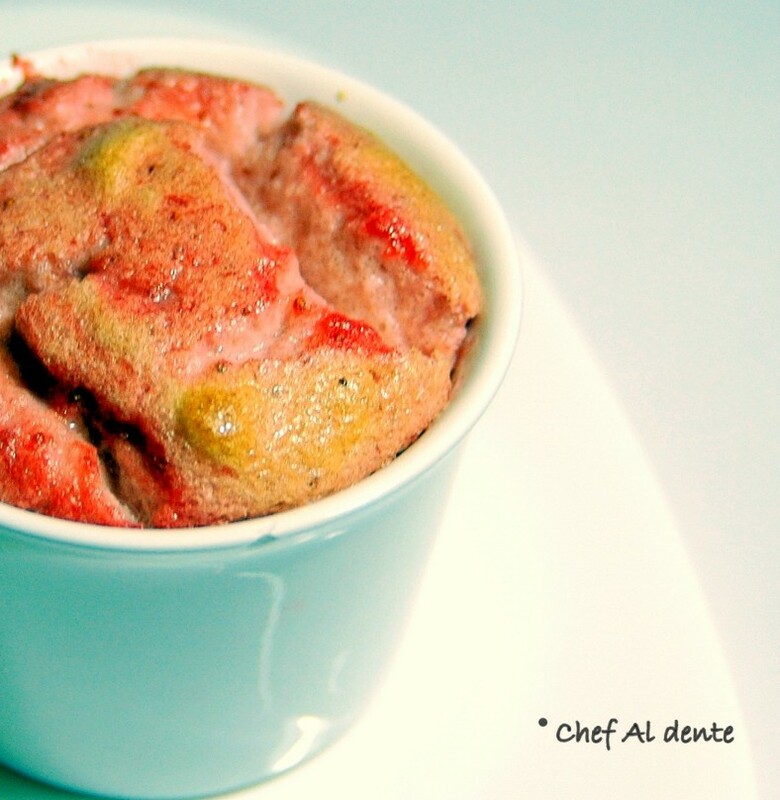 Chef Al dente: Strawberry Souffle: The Pink Beauty! Strawberry Souffle: The Pink Beauty! Pretty in pink, light and airy with the refreshing sweet flavour of fresh strawberries - that is strawberry souffle in short :) Souffle is a French term that refers to any light, fluffy baked dish; can be sweet or savory. Egg is an important ingredient in souffles as it gives the airy texture and imparts the right consistency. You can find couple of recipes that use egg substitutes like baking powder, silky tofu etc. Since this is my very first attempt making these pink beauties, I decided not to take any risks! But I avoided egg yolks and these are made using egg whites only. A valuable source of antioxidants, the nutrient profile for strawberries (source: WHFoods) is given below. Protection against cardiac diseases and regulating blood sugar are some of the important health benefits of adding strawberries in your diet. Relatively simple to make, I think the critical step is when you whip up the egg whites. Being light handed and quick is essential. Well if a lousy cook like me did it, I am sure anybody can! So go ahead and give it a try. Will make a light and cute dessert after a wonderful meal. Preheat oven to about 180 deg Celsius. Puree the strawberries with sugar and honey. Add salt to the egg whites and whip it till they form soft peaks. Very gently fold in the puree into the egg whites. Butter the sides of two ramekins and fill each to 3/4th with the mixture. Bake till the surface is golden brown. Took me about 10 minutes. Keep an eye on it though. Serve it warm or chilled. Wow Looks so colorful and yummy! Thanks for dropping by my site. oh wow!! i have eaten chocolate souffle before but this is the 1st time im hearing of a ruit one... looks amazing! Very delicious, looks very tempting.. The pink color is stunning!! Indeed a pink beauty,love souffle!! I now wonder why didnt I ever make them.. this recipe has brought me back to grounds Rosh.. I should really get back to cooking easy and different recipes like this one..
Lovely pinkish and yummy souffle. Lovely souffle. The colour is so pretty and I am sure it must have tasted great! Well done! First time here.. Love your space for its look and a variety of dishes! Great going!! Gorgeous souffle. Very simple recipe too....must try.